alaTest has collected and analyzed 364 reviews of Kodak Playfull ZE1. The average rating for this product is 3.5/5, compared to an average rating of 4.1/5 for other Camcorders for all reviews. People really like the image quality and size. The portability and price also get good feedback, but there are mixed opinions on the zoom and durability. The color and reliability get critical reviews. We analyzed user and expert ratings, product age and more factors. Compared to other Camcorders the Kodak Playfull ZE1 is awarded an overall alaScore™ of 82/100 = Very good quality. Ideal for a young child or those who don't want expensive equipment just to record videos. 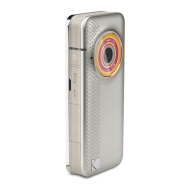 A camcorder aimed at a young, fashion-conscious user, the Kodak Playfull ZE1 comes in a choice of black or silver with blue, orange or purple detailing around the lens. Did not get the brush and air squeeze thingy. Like the small size. Currently looking for an AV cable, wish it would have came with the camera. Solid camera, well made. Bought for my teenage daughter. Looks and feels like it will stand up to her use. The camcorder is not upto my expectations. doesnt hav flash. not a lot of internal memory. YES, THE VIEWING SCREEN IS QUITE SMALL; HOWEVER, IT DOES A GOOD JOB OF CAPTURING THE MOMENT. IT'S SMALL AND EASY TO CARRY AROUND. GREAT VALUE FOR THE PRICE!